Stems: Prostrate or climbing vine, sticky-hairy; climbs via forked tendrils. Leaves: Alternate, simple, thin, circular in outline, up to 8 inches long and wide, surfaces rough, margins minutely toothed; lobes 3-5, shallow, tips pointed; base with deep sinus; stalks 1 to 3 inches long. Inflorescences: Monoecious (staminate and pistillate flowers on same plant); pistillate flowers in long-stalked, head-like cluster in leaf axils; staminate flowers in axillary racemes and corymbs from same leaf axils. Flowers: Calyx small, inconspicuous, 5-toothed; corolla 5-lobed, white to pale yellow; stamens and anthers united in column. Fruits: Egg-shaped, yellowish, 1/3 to 1/2 inch long, dry, usually covered with prickly bristles, pubescent, in clusters of 3-5; seeds 1, flattened, smooth, olive-green. Habitat: Stream banks, thickets, edges of lowland woods, ditches, brushy waste areas, and roadsides; damp soils. 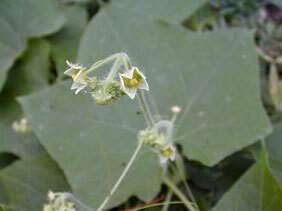 Comments: Bur cucumber is a fast growing native vine. It provides cover for upland game birds and songbirds.